These devices lock the rope automatically when shock loaded (e.g. a fall) and are consequently extremely popular. The belayer doesn't need to do anything to stop the actual fall, but since these devices tend to be rather static, a step forward or even a small jump can absorb the fall and make it more dynamic. This can help avoid injury and is better for the rope and all the equipment in use. These devices must not be held onto during the fall, as the rope may not lock automatically. As these devices accept only a single rope (10-11mm), they are mainly used at sports crags, where their excellent handling give the belayer more "freedom" while the climber is resting between attempts. These devices appear to be foolproof, but they are not; they require a certain degree of experience before being used expertly. For example, it can be difficult to pay out rope quickly for the leader and care is required when lowering the leader - always hold the dead end of the rope when lowering the climber to the ground. Narrower ropes (9.5mm) are increasingly being used - this is not recommended as the rope can slide through the device without locking, especially if it is new. They can be attached directly to an anchor to bring the second up to a stance; this is not recommended with belay devices which do not lock automatically. 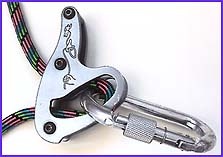 This is the most popular automatic locking belay device, imitated but as yet unequalled. Be careful when lowering off, and with new, narrow ropes! Excellent abseil device for working on the crag ( bolt placing, route setting, etc.). Simple and efficient, this is at the moment the best alternative to the Grigri. - The correct carabiner is essential - depicted above is a karabiner with parallel sides. These are ideal as, even if the karabiner moves position, the locking action remains equal. Pear shaped karabiners have the disadvantage of an acute angle which impedes the locking capacity of the SRC. excellent for top roping, also for novices as lowering off is slower and it is initially simpler to use than the Grigri. Pay attention with different carabiners (not recommended) and different ropes. This is a self-arresting device similar to the Single Rope Controller but with a different arresting mechanism. 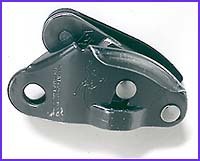 The rope locks because of the friction generated between the device and the carabiner and also because of the V-shaped notch. - ideal for toproping. Pay particilar attention with ropes and karabiners of different diameters.